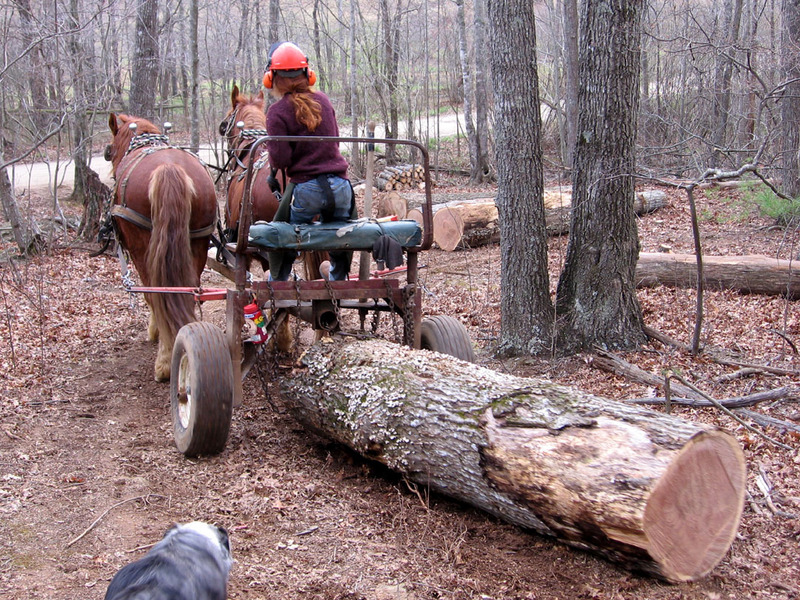 Here is Mel at work, skidding logs in late March at this year’s Open Woods Day in Floyd, Virginia. She and Adam are apprenticing with the Healing Harvest Forest Foundation to become Biological Woodsmen. They’ll head back up north to their farm soon, to start operating their own restorative forestry business there, and will train, work, breed and care for my mares for a little over two years, until I can get boots on ground at the Farm in Kentucky. It is my hope that the contribution of living capital, both the horses to use and the foals they’ll keep, will help them get a good start. Mel’s a quiet girl, but intense and passionate too. Were you to meet her on a busy city street, you wouldn’t guess she works in the woods with horses and chainsaws and huge, heavy logs. Having done a myriad of non-traditional jobs my whole life, I can really appreciate another woman who fearlessly chooses to follow her heart into the woods and the fields and do work like this. It isn’t just for men, and it’s a lot of fun, and we can be very good at it. These two young people are very special, and very important, to their community and to the world at large. Not afraid to roll up their sleeves and learn a complex craft that defies the conventional mindset of profit over every other thing, and that gives back to the Earth and her future generations. They give me hope and remind me that good, honest dreams built of hard work are still all some folks need to be happy in this life. Makes me feel good, that. First, I have to tell you about the horses. I wrote this guy who logs with horses and teaches folks to do the same, and who’s been breeding and working Suffolk draft horses for more than three decades now. Emails followed, a conversation was struck up, I told him my intentions for working my farm and woods with horses, and somewhere in there the question arose, how soon would I be looking for my team of Suffolks? I am never one to wait until the last minute to do or learn to do or get the things I’ll need to do, anything. So I said, I’ve got the money right now, I would just need to find someone who could use them and work them for three years until I finish this Navy gig and finally move to my farm. Thinking to myself, that would take a lot of planetary alignment to make happen, but what the hell, I’ll mention it. The conversation continued, and a couple of emails and phone calls later, we were discussing a team of Suffolk mares he’d pointed out for sale down in North Carolina, and he said he had a couple of young apprentices training with him there in Virginia that would be good candidates for the sort of arrangement we were talking about. The idea in essence: they use and work my team as their starter team, breed them both and keep the foals, then return them in three years as an experienced team for me to begin my work on the farm with, rather than me having to find and buy a green or barely-worked team and struggling with my learning curve as well as the horses’ that first year. Well, the North Carolina horses didn’t work out – the seller got cold feet when my conversation turned serious and I mentioned the need for a breeding soundness exam (they were both maiden mares, 9 and 10-years old). But I’d already emailed another fella up in Michigan, who was getting out of raising Suffolks because his heart surgery had slowed him down, and had a younger pair of mother-daughter Suffolks for sale. They were big and built right, with good feet and the kind of conformation that would add a lot of good foals to the dwindling gene pool of this endangered breed of American work horses, and the only other buyer interested was an Amish farrier who would not have bred them, just worked them. So I bought ’em. And now we’re trying to get them hauled from Michigan to Virginia. And it’s winter. And the ex-wife of the seller who agreed to get them there by the end of November, has had some issues and is only just now able to do the haul. We’ve got a three-day weather window this week, with clear skies and next-to-nothing precipitation forecast, but I’m here in Africa unable to be reached by phone with only email to coax this process along. So today, or tomorrow, this will happen, or it won’t. I am waiting to hear.